What is Marxist dialectical thinking? As Greece's rich flee, will the workers rush in? No to "work for your dole"
The two-day general strike on 19-20 October was the biggest of all the general strikes of the last two years of struggle in Greece. 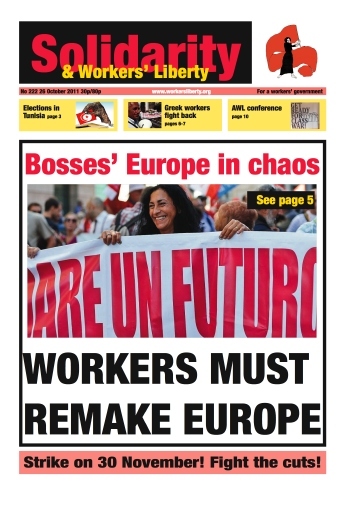 Over 500,000 public and private sector workers, pensioners, students, self-employed, community activists marched on Athens and over a million all over Greece. The slogans shouted by the strikers and demonstrators demanded the overthrow of the government and the withdrawal of the austerity measures and the policies of the Troika (European Union, European Central Bank, and IMF). Malcolm Grant, the Provost of University College London, has been nominated by health secretary Andrew Lansley to head the new NHS commissioning board responsible for implementing the Tories’ health “reforms”. So Grant, who has distinguished himself attacking students and workers at UCL, will now also be responsible for dismantling the NHS. An “Operational Strategy” paper from London Underground management, leaked by tube union RMT, has revealed plans for a radical restructuring of the tube that could see 1,500 jobs axed. Activists in “N30” unions — the unions that are set to participate in the mass public sector strike over pensions reform — are working hard to build for 30 November. The Tory right mobilised on 24 October, with the help of the right-wing tabloid press, to demand a referendum on British withdrawal from the European Union. They recorded 81 votes against the government. The Tory right resents the limited legal rights which British workers get from European Union legislation driven by countries where labour movements are stronger and less legally shackled than in Britain. The core of socialist-Marxist thinking is its methodology, dialectical materialism. But the term was not systematically analysed by Marx or Engels. One has to synthesise its meaning from thousands of pages of their collected works. In the 1930s, when the Stalinised Communist movement responded to the rise of National Socialism in part by competing to out-do its nationalism, Leon Trotsky explained what was wrong with that “national communism” - developing themes he had written on earlier, during World War One. We publish extracts below. It’s a corporate dream come true: imagine if a company could find out exactly which customers — and potential customers — could influence others. If one could identify with precision those consumers who influence others in their buying decisions, one could make a fortune. That’s the reasoning behind a number of new web-based projects that are basically watching all of us online, seeing what we do on Twitter and Facebook, and attempting to measure our influence. After the two-day general strike on 19-20 October, strikes and occupations are continuing across Greece. Bus, tram, and tube workers strike for 24 hours on Tuesday 25 October. Transport workers strike for 24 hours on Thursday 27 October. Public sector workers have announced occupations of ministries and public sector buildings for Wednesday 26 October. Lawyers will have a four day strike on 26-27 October and 3-4 November. Teachers have a 24-hour strike on Wednesday 26 October.